If you have a pet cat, you know how important finding the right litter box is. Kitties are fiercely independent creatures, and they appreciate having a nice litter box to do their business in. There are so many different models with different features available from boxes that are self-cleaning to others that resemble planters to keep your pet’s bathroom on the down low. We’ve compiled a list of the top choices in litter boxes as well as a handy-dandy guide to help you sort through the various details of different varieties of box options. The PetSafe ScoopFree Ultra Self-Cleaning Litter Box combines technology and sanitary standards to provide an amazing litter box design. It eliminates the hassle of daily scooping and cleaning by doing the dirty work for you. This item self-cleans for weeks and is up to five times more effective at reducing odors than options utilizing clay or clumping litter. The PetSafe ScoopFree Ultra Self-Cleaning Litter Box includes a built-in health monitor that tracks your pet’s toilet habits. This can aid you in identifying any health maladies faster. You can also decide between regular and lavender scented crystal trays to use with this system. The CatGenie Self Washing Self Flushing Cat Box offers a solution for busy owners. This litter box connects to a human toilet. Using an electronic system, it liquifies solids while urine passes through the granules in the box. The granules are permanent and washable, so they never require changing. The CatGenie washes and flushes itself based on a timed program that you can set and change to fit you and your cat’s schedule. It may take your cat a little time to grow accustomed to this setup. On the negative side, it is very expensive. 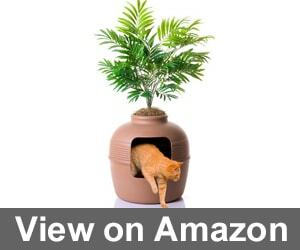 The Hidden Cat Litter Box by the Good Pet Stuff Company looks like a pretty clay pot planter, complete with a plant. It’s incredibly easy to set up and use. The top portion of the litter box removes easily to allow for scooping and cleaning. The Good Stuff Pet Company Hidden Cat Litter Box is an excellent solution for pet parents that live in a smaller space such as an apartment, or those that don’t want to look at a traditional style of litter box. It works well for small or large cats, as well as multiple cat homes. This litter box is perfect for those who want a visually please yet completely functional model. The Petsfit Espresso Double-Decker Pet House Litter Box comes in a gorgeous espresso or a clean white. This multitasking option works as both a kitty home and a kitty litter box. Your precious pet will get the best of both worlds with this selection. The Double-Decker Pet House Litter Box is the perfect size for large cats or multiple cat homes. It’s aesthetically pleasing to the eye, and cats really enjoy lounging in and on it. 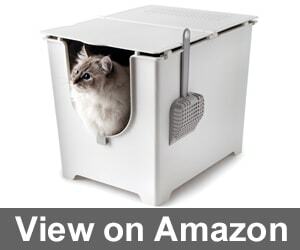 This is another wonderful choice for those who are short on space and want to have both a litter box and housing option. 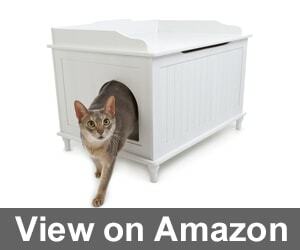 The Designer Catbox Litter Box Enclosure is a beautiful option to hide an unsightly litter box. It’s crafted to house a standard sized litter pan. This item also features an interior door to assist in cutting down on litter tracking, which can be removed to accommodate larger pans. The Designer Catbox offers quaint country charm to disguise your kitty’s bathroom and cuts down on odors. It’s pretty enough to be placed in your living room while hiding its true contents. It’s also fairly easy to assemble. The Modkat Litter Box is a modernly designed option for cat parents that want to save on space without sacrificing on style. This top entry option is available in a variety of colors. 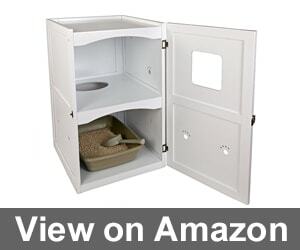 It utilizes a reusable liner, so it’s more environmentally sound than other litter box options. This offering from Modkat combines sophistication with practicality. Cats seem to like the design, plus it’s super easy to assemble and clean. The only downside lies in the fact that extra-large or older cats may have a hard time using this box, so it may not work perfectly for all kitties. The Modkat Flip Litter Box features an adjustable, flipping lid that makes customizing this choice simple. For private bathroom using kitties, the bin can be completely covered. You can also turn it into an open little box design. You can also opt to leave it partially covered, depending on you and your cat’s preferences. The Modkat Flip Litter Box comes with a scoop to make daily cleaning duties fast and simple. This model has a reusable liner that can stay in place for up to 3 months saving you both time and money. The high sided walls on the Modkat are perfect for higher peeing kitties that haven’t done well with lower sided models. It’s roomy and fits a wide variety of breeds and sizes perfectly. The Merry Products Nightstand Pet House/Cat Litter Box offers a quaint design that looks ready to sit in a beautiful cottage. It can be used with a plastic litter box or as a pet house for cats or dogs. It can also double as a nightstand on top with an area for pets underneath. This is a great choice for owners that view standard litter boxes as an eyesore. This set up will make an attractive statement piece that doubles as a pet home or litter box. If you choose this option, look into investing in a waterproofing mat that will guard against the inside wearing out. The Tidy Cats Breeze Litter System provides an excellent option for pet parents that are tired of litter being tracked around their home. It has been specifically crafted to separate urine from solid waste utilizing specially designed litter pellets and pads. The Breeze litter pellets are dust-free while the Breeze litter pads absorb urine while minimizing odors. The Tidy Cats Breeze Litter Box System is easy to clean and use. The initial kit is extremely cost effective, making it a smart buy. Conversely, the price to continue to use it gets higher. You will need to purchase the Tidy Cat Breeze Litter Pellets and Pads which cost more than traditional litter in addition to the pads that are necessary for the system to function properly. If litter box smells are a huge concern to you, this system is most likely worth the inflated monthly cost. 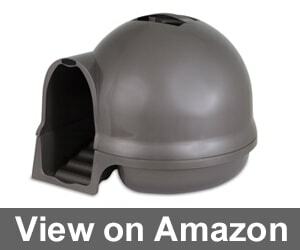 The Petmate Clean Step Litter Dome is reminiscent of an igloo. 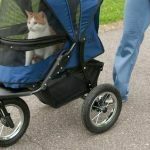 It’s available in several colors and features a unique step design that allows cats with mobility issues easier access to use the bathroom. It also helps to cut down on the dreaded litter tracking issue that many litter boxes create. 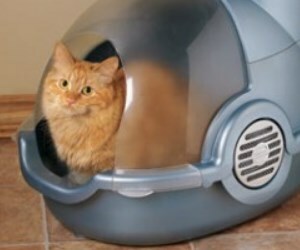 The Petmate Litter Dome is fifty percent larger than other designs making it roomy enough for the biggest of housecats. A built-in handle at the top of the domed cover allows for easy and fast cleaning and scooping. 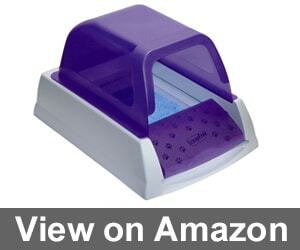 Additionally, this item incorporates a carbon filter to cut down on litter box smells to keep your home nice and fresh. Compared to other pets, cats require less upkeep and have a higher level of independence. You won’t need to walk them several times a day like a dog for example. One daily chore of owning a cat, however, is ensuring their litter box is clean and fresh. Failing to do so may result in your kitten deciding to claim other areas of your home as their personal potty, which will lead to a messy and smelly conundrum. 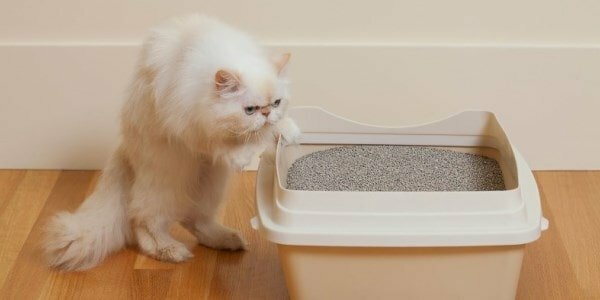 We’ve created this buyer’s guide to assist you in navigating the important details in selecting the best model of litter box for you and your favorite feline. It’s a good idea to have a litter box for each cat in your home, plus one extra. Many cats will refuse to use a litter box that another one has already used. If your house has more than one floor, you should place a box on each level to help make sure your cats don’t try to make their own areas to relieve themselves. So, a three-cat home with two floors would probably do best to place two litter boxes on each floor for a total of four boxes. • Open Top Litter Box: This type of litter box is the traditional model, consisting of a rectangular box. This model is usually the least expensive option with no frills. • Covered Top Litter Box: Similar to the traditional open top model, this type of litter box adds a cover or hood that gives your kitten privacy and may also cut down on any smells. 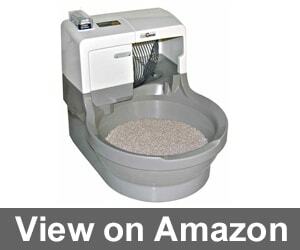 • Self-Cleaning Litter Box: While more expensive than other models, this type of litter box cuts down on cleaning time. This is thanks to an electric rake that sifts through the kitty litter and scoops away any clumps. • Hidden Litter Box: This model goes incognito with a design meant to blend into its surroundings. Popular options include litter boxes made to look like a planter or other furniture so that only you and your cat know it’s actually a restroom. 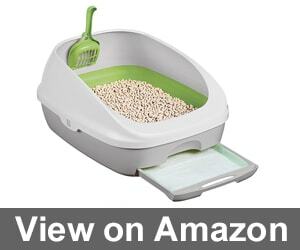 • Sifting Litter Box: This version allows you to and-sift clumps in a manner that’s somewhat similar to panning for gold thanks to a secondary box that tucks into the litter box. Litter boxes are available in many different sizes. Kittens grow quickly, so selecting a small litter box can create a headache later on as you realize Fluffy has outgrown it and needs a new one. Bigger is usually better when it comes to choosing a litter box. Choosing to skimp on size now means you increase the odds that you’ll wind up with accidents and litter tracked throughout your home. Your pet should have enough room to turn around while they are inside the box fully. 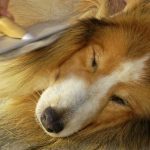 Selecting a model that is one and a half times longer than your pet and that is as wide as the pet’s length should offer them the right amount of space needed. You can find litter boxes with entryways on the top of the box. This feature can cut down on litter being tracked through the house. It can also be helpful if you have young children or another pet such as a dog, who may try to get into the box. On the downside, this type of entry may pose a challenge to obese, elderly, or larger kitties. These pets may require a standard side entry or even a lower entry point to ensure they can easily get inside to do their business. Think about the area where you’ll be placing the litter box. Don’t try to cram a larger box into a tiny, hidden corner. The cats won’t want to use it and may try to go to the bathroom somewhere else, like a nice rug or in a plant. 2. Clean the box daily. If the box isn’t cleaned on a regular, daily basis, finicky cats may get upset. This can lead to their refusal to use it. This also helps keep any unwanted odors and germs at bay. 3. Switch out an old box for a new one slowly. If you are upgrading to a new box, place it next to the older one for a few days Let your feline friend get used to the newer box before removing the old one. Otherwise, your pet may refuse to use it altogether. 4. Consider chores like cleaning. When choosing the best place to put the litter box, think about its upkeep. You want to find a place that is comfortable for your cat. You also want it to be easily accessible for cleaning and maintenance. Litter boxes require daily cleaning to sift out and remove clumps. You’ll also need to deep clean it on a regular basis. When doing a deep cleaning, avoid the use of any strongly scented products, like bleach. The introduction of unsavory smells can send your kitten away to seek out a different place to go potty. To properly clean the litter box, you’ll need rubber gloves, hot water, soap, sponges or rags, and some vinegar. Put on your rubber gloves. Dump any used litter into a trash bag and dispose of it properly. Add some mild soap to the hot water. Scrub the litter box with the sponge or rag. Use care to ensure any dried feces or litter is completely removed from the box. Once you have thoroughly cleaned the box, rinse it well with hot water. Make sure you completely rinse any lingering scents of soap away so that your cat will still use the litter box. If the litter box has any lingering scents, you can pour vinegar into the box and allow it to sit for 30 minutes before rinsing. You can also try using baking soda as another natural, odor absorbing trick. Dry the box either by wiping it out with a dry rag or paper towels. You can also let it air dry. After it’s completely dry, refill the litter box with new, fresh kitty litter and replace it in its usual spot. Choosing the right litter box can be a headache-inducing process. In addition to finding an option that makes your feline friend happy, it must be functional, keep smells and messes at bay, and be easy to clean. Considering your space and needs will make the process much easier, and will result in a happier and cleaner environment for your kitty. There are many excellent litter box options available. Today’s offerings have taken the simple concept of a standard litter pan and incorporated design elements to disguise your cat’s bathroom. 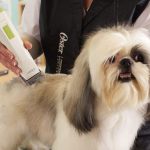 Other models have made cleaning the litter box easier than ever before. We hope that you enjoyed our litter box reviews and buyers guide. Don’t forget to leave us a comment below about your favorite litter box. Maybe for someone it can be crazy, but I really recommend to buy CatGenie Self Washing. You can’t imagine how it saves your house from the smell. Of course, if your cat likes digging and pooping in the middle of the box it won’t suit you. But for cats with good manners it’s the best option. You won’t understand which litter box is the best until you buy it and give to your cat. Reviews and guides are very helpful, but you never know if your cat wants to make a mess out of it or to dig everything out of the box, or to poop on the angle. While choosing the box try to imagine YOUR cat in it and you won’t be disappointed. I found out that my cat is obsessed with litter boxes which have an entry on the top. I don’t know why, but she refuses to use another one. It’s so funny because she’s plump and every time she wants to make her dirty things, everybody hears how she flops in it. Cat’s are weirdo really. The future is real! I couldn’t think that there will be a self-cleaning litter box ever. I’ve bought the PetSafe ScoopFree Ultra for my cat and I can’t explain how it has improved my life. Look at this design! Of course, replacement trays aren’t cheap, but if I count how much time it saves me, I won’t wish anything else. I have the third cat now and the most important thing about their litter boxes is that they’re not actually for them, but for you, for a good smell in the house, for saving your time. Your cat will get used to the box which you give him or her, believe me. That’s why don’t try to save money a lot, buy the most functional one. My cat (I don’t know why” likes hooded litter boxes. A lot of experts recommend to buy only open, but they don’t work with my fluffy boy. Maybe he feels more safety in such boxes, I can’t say, but we don’t need to clean it so often, cause he doesn’t dig everything out as he used to do all the time. The Tidy Cats Breeze Litter System is a new solution for me, recommend to everyone who wants to get rid of a smell. It’s not perfect though cause the pellets are very heavy and they just can break easily. Moreover, it would be better if it was little bigger for such big cats as mine. But still don’t be afraid of purchasing it. It’s a big luck to find a suitable litter box from the first trial. We’ve changed about four different, but our cat didn’t like any of them, She used to digging everything out and to poop beside the litter box and not in it. But thanks God we’ve found the best system. The way all the litter boxes look is so awful! 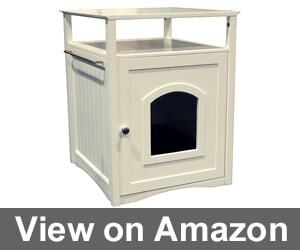 I don’t like seeing such thing in my home, except for one – The Merry Products Nightstand Pet House. It’s so beautiful! Nobody can think it’s a place where your pet is doing something dirty. Recommend it to everybody, who doesn’t want to ruin the interior. I don’t know how to choose a litter box when your cat is about pooping everywhere but not in the box. We took the cat as an adult, our neighbor became ill and asked for help. And now it’s a big trouble for us to make this cat understand what is allowed and what is prohibited. I don’t know what you all guys reading and searching, cause the ideal litter box already exists! Haha I’m just joking but look at The Hidden Cat Litter Box, do you see the same thing as I? Cat just don’t ruin your flowers, but sit in it. It’s a miracle, that suits every room design I suppose. I’ve bought it without any thoughts. Agree with you! The best and the most beautiful litter box I’ve ever seen. I couldn’t find a good litter box until reading this very helpful guide. Thanks for pros and cons and quality videos. I ordered a litter box yesterday, hope my cat will like it. Which one have you ordered? I’m just wondering which variant among the represented ones is the best one. The best litter box is the one which your cat uses every day without any problems, it gets rid of any odors and looks good. For me, such litter box is The Modkat Litter Box. Like it so much and recommend to all cat owners. My cat has such terrible character! It was so hard to make him use a litter box. Of course, it’s not only about his character, but a litter box. When we’ve found the right one, the problem went itself. Recommend everybody to try different boxes until your cat will love it. What I like about the today’s world is not only that you can have a little fluffy creature in your home, but that there’re technologies which get rid of all downsides of having a pet. I’m talking about litterboxes which clean themselves without using your hands. My favorite one is The CatGenie Self Washing Self Flushing Cat Box. Yes, It’s a little bit expensive, but nothing can be better than have such a thing. I dream about having this one, but, unfortunately, it’s hard for me to pay so much money for a litter box. When I was looking for a litter box I found a lot of positive reviews about one box. I loved it at first and my cat was quite satisfied but after some weeks of using all flaws became obvious. The problem is that I was hesitating for a long time and then found many comments about its good quality. My only recommendation is not to believe in all that stuff people are writing. I disagree with you. I’ve found my litter box only because of reviews and comments I read. So it’s just a matter of the case. If you feel the smells and can’t live with them anymore, I personally recommend you to buy The Tidy Cats Breeze Litter System. Yes, it may be not very convenient for someone, because you have to buy some specific pads, but I’m quite ok with that. My cat liked it for the first time. I have spent so much time reading guides and watching videos what to buy, what to use, what litter box is the best. Finally, I got it delivered and I was completely disappointed. Never think that you’ll have the same situation with people on the internet. A litter box is a very individual thing. I’ve had so many cats in my life and every new one needed a new litter box, which suits only this cat. Maybe I’m just lucky and all my cats’ characters were hard. So, after years of living with these naughty creatures, I can say that The Modkat Flip Litter Box is the best. My house is always clean with this, litter never falls away from it (only when your cat brings it on fur). Finding a good litterbox is a real headache. I was so glad to find out that my cat likes the cheapest variant I found and there are no unpleasant smells in our house, everything is good. But the main thing is that I didn’t pay much money. Yet The Petsfit Espresso Double-Decker Pet House Litter Box is very expensive I feel like I don’t waste money. It’s very comfortable litter box, my cat thinks the same, and my little children are kept away from the litter, for me it’s very important. I don’t know what to say more, just if you have a necessary sum of money, don’t search for anything else. My friend used to complain that she couldn’t find any litter box that didn’t smell so much, I gave her a lot of recommendations and tips how to get rid of the odour, what box to buy, what to do. And then it turned out that she just didn’t clear the litter box daily. Ugh I was so angry at her! Just want to say that before complaining about the quality and product, check out that you do everything right. I hesitated so much choosing The Modkat Litter Box a couple of months ago because it doesn’t look like the most comfortable litter box, I thought my cat would even refuse using it. But I was mistaken (luckily) and now everything is great. The house is clean, the cat is glad. My cat has been using the same litter box for a year and I decided to change it. I threw away the old one and put the new one in the place. And you know what? She refuses to use it! I don’t know what to do really… I’ll try to find the same litter box, maybe she won’t notice any changes. I was thinking of buying a new litter box for so long because I wanted the one which was very and very expensive. But, finally, I got it and now I have nothing to complain about, it’s the best litter box I’ve ever had. Sometimes spending more money really means buying the best option. There isn’t much that you can say about litter boxes. “So I have a box and my cat poops into it, everything is ok”, but it’s not the case when we talk about The Petmate Clean Step. It’s the best option which I had, it’s not terrible to clean up and my cat doesn’t use any other places cause I hope she likes this litter box. My experience with online ordering is awful, maybe I’m too inattentive but this time I again ordered something not suitable for my cat, the size of the litter box is too small. So I think I should make a choice here and then go to the real shop and buy. My friend presented a litter box for my cat when I changed the flat, the old one was thrown away and I was shocked my friend came up with this idea. This litter box is still working for my cat, he likes it and if we change it then only for the similar one. The best litter box is the cheapest one so I don’t understand why people make reviews and long comments about it. Just go to the nearest shop and buy it! How cute is the cat on The Modkat Litter Box photo! Like this litter box so much, it seems to me this is the only one which can prevent any smells and litter. I don’t remember the last time when tidying was so comfortable. Agree with you! I have this litter box for about three months and can’t be happier. It’s so clean in the house, and my cat likes it. Recommend to everyone! How much time I’ve wasted on searching for an ideal litter box for my cat! But they all have some disadvantages, there isn’t a perfectly comfortable one. I don’t ask much, just create one litter box suitable for me and I’ll buy it again and again! When you find an IDEAL litter box, there’s no need for buying it again and again as it’s durable and resistant to damages. I suppose, there’s no ideal litter box on the market, just try to estimate which is more suitable for your current situation. My cat and I prefer simple equipment so our favorite litter box is The Tidy Cats Breeze Litter System. She likes it because of convenience and I find it perfect because of the odors blocking. I have a toddler so it’s the best variant to prevent my child from contacting with these unpleasant things. Oh, this comment is the most helpful for me. Hope, it will work for me and my little child well too. I saw a Good Pet Stuff Company litter box here with an “editor’s choice” mark but I want to say some not very positive things. Of course, it looks great and my cat adores it but the plant above is awful. Now I’m thinking of replacing it but I don’t know what I want. I think this litter box is too expensive for its quality. I agree with you on some points. But does the plant really matter? It’s very easy to replace but the idea is great. The PetSafe ScoopFree Ultra Self-Cleaning Litter Box is a thing I would definitely recommend to all my friends and relatives with cats. Like it very much! It keeps all odors away from us so I can’t ask for anything more. The best litter box I’ve had was from the local shop and cost some dollars so I don’t know why people buy something sophisticated. It’s just a cat’s toilet! Modkat Litter Box is a time-saver for me. I spend very little time cleaning it and how good it copes with odors! So try to use this one if it’s really hard to find an ideal variant. I can’t find a litter box which removes all odors. When I see it has this feature I buy it and it still doesn’t work good enough. Maybe it’s just impossible? As my pet is huge it’s quite hard to find suitable equipment. Speaking about litterboxes, our choice is Petsfit Espresso. I know how hard it may be for owners like me so I hope this recommendation is useful. The last litter box which I bought was on sale, that’s why we got all benefits for a little price. But now it’s time to choose a new one and I don’t really know what to do as there are no suitable variants for the money which I have. 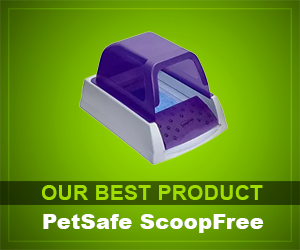 The PetSafe ScoopFree Ultra Self-Cleaning Litter Box is the best cat litter box for me. I’ve seen it in the photo in my favorite blogger’s Instagram and decided to buy the same one. ANd I’m happy about this choice! Designer Catbox is a thing which I find the most good-looking one. I was glad how easy it’s to assemble this litter box. So look at this one while searching. 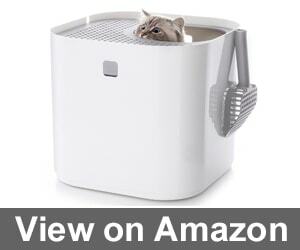 I also had this option before, but can’t say it’s the best litter box I’ve ever used. Now I’m searching for something else. My choice is Tidy Cats Breeze as I’m very sensitive to smells. It helps to get rid of all of them. It’ll be a good option if you have a child and want to prevent some allergies. This is the very litter box I wanted to recommend, but you’ve already done it. Recommend it not only for those who have children but for those who’re slightly allergic to cats and don’t want it to be a problem. I like the litter box that I bought very much, but there’s one fact that spoils my good emotions about it. Replacing trays costs me so much money, I couldn’t imagine. So now I think about presenting this litter box to my sister as her salary is bigger than mine. My cat is large, that’s why the cleaning process always looks like a huge disaster. I needed something which could help me with it, and I bought Petmate Clean Step litter box. I have nothing to complain about, it’s the best mat I’ve ever had. I like that my reparations don’t influence on comfort. When I change the wallpaper every time, I just buy a new color of Modkat Litter Box. This litter box is the best one as it’s easy to clean. I’ve been using it for years and don’t want to change my preferences.